The short story is that I, Zachary Feinstein, have declared for the 2008 NBA Draft. 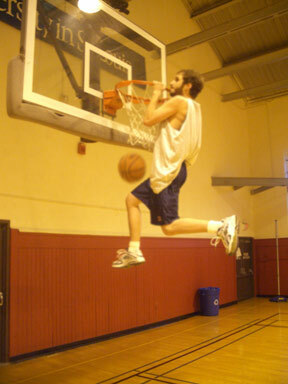 As a 5'8" 130 pound Caucasian, I am the perfect candidate for professional basketball. Also, I do not play basketball. You see, I am not currently on my college's basketball team (Division 3 just for reference) nor did I try out to be. I was at no point on my high school's basketball team nor did I try out to be. I was at no point on my middle school's basketball team nor did I try out to be. The last time I was on a basketball team was before Bill Clinton got caught with his pants down. So there you have it, I, Zach Feinstein, was in the 2008 NBA Draft. If you do not believe me, go to: draftexpress.com or nbadraft.net for proof (under "unknown players"). I would like to thank everyone for their support, unfortunately it seems the Boston Celtics thought Semih Erden was more likely to help their team than I was.